When an element strengthens or “produces” another element, we strengthened that elements qualities using the productive sequence. 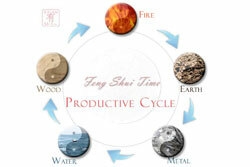 You will use the Productive, or Creative, cycle when you need to strengthen a particular feng shui element. For example, let’s say, you need to strengthen the Wood feng shui element in a specific area. Besides the obvious step of bringing more Wood energy (with plants, wood décor items, colors green and brown, etc), you will also focus on bringing more of the Water element because it nourishes the Wood. You can do that with an actual water feature such as an aquarium or a fountain, with images of water, mirrors, as well as décor elements in deep blue or black colors in fluid shapes.